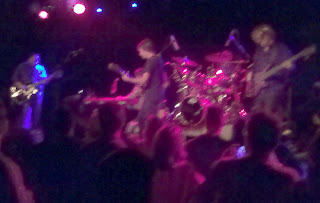 We saw Toad The Wet Sprocket at Higher Ground last night. It was a great show. The last time they came to Higher Ground was apparently 15 years ago, before they had broken up. The band played a few new unreleased songs, as well as, of course, all of their most popular songs from the 90's. As a 6 piece, the arrangements and overall sound of the songs were pretty much exactly as they are on the albums, with the addition of lap steel and keyboard player Johnny Hawthorne to fill out the sound. Dean Dinning's bass playing, as seems to be the hallmark of the rest of the band, is "tasty" yet subdued. If you watch him, he is all over the fretboard, doing tricky runs even while singing solid backup vocals, yet the overall effect of it on the music is very well placed and subtle. I recall his note and phrasing choices being something of an influence on me while I was (really) learning to play bass, in the late 90's. Dinning's gear for the show was either a Markbass or Eden head (a little hard to make out), going into a Markbass 4x10" cabinet, and his usual 6 string Warwick Thumb. The really cool thing about the show was how laid back it was. Glen Philips (lead singer), Dinning, and Todd Nichols (guitar), were very conversational with the audience. I mean, literally just chatting back and forth with a few of the people up at the stage at a few points in the night. At one point a lady in the audience wasn't feeling too well, and they stopped to make sure she was alright, Philips handing her husband a bottle of water to give to her. Another time, when we were on line waiting to buy a t-shirt, the merch guy got up and left the booth for a minute to run up on stage and play cowbell. I forget what song it was, but it may have been "Fall Down". Philips joked a couple of times throughout the show about the "high energy, heated rock-n-roll" that the show wasn't, with the band at one time breaking into a 2-beat shuffle spoof of "Crazy Train". But personally I appreciated the easy, informal presentation of the concert. It made the band more accessible and less "larger than life", an attitude that is probably much better suited to a band in this post-record-industry era. Crap, tried to get caro there, no dice. I really envy you on this one.